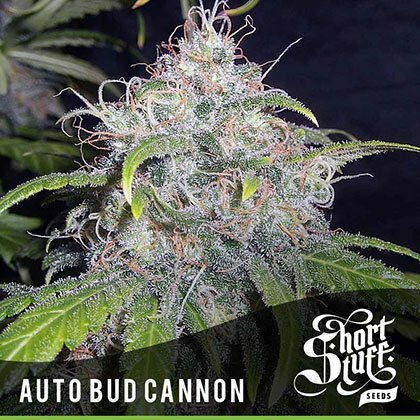 Buy ShortStuff Auto Bud Cannon seeds from dope-seeds.com now! If you are looking for a big production heavy hitting auto-flower strain then look no further than Auto Bud Canon. This strain boasts AK47 and critical mass in its genetic makeup so you know it is going to yield big and pack a real punch. Auto Bud Cannon grows incredibly quickly and can often reach 1.2m (40) with plants exhibiting a dense, branchy structure. The numerous branches will be covered in tight, compact buds which will pack on lots of weight during its flowering period. In normal circumstances this plant will easily produce 30g (1oz) but with some care and attention and the right conditions Auto Bud Cannon can easily yield 60g (2oz) per plant. Once dried or cured the rock hard bud cannon Nugs give off a strong skunky aroma and the flavour is very strong and intense. This strain has a wonderful effect with an old school chatty, uplifting high which is perfect for social situations. The great thing about Auto Bud Cannon is that growing her is as easy as ABC! She is so simple to grow, a set and forget variety, that does all the work for you and produces amazing results, even for novices. Auto Bud Cannon is part of our Boutique Line of cutting edge Autoflowering cannabis genetics. The Boutique Line contains the most up to date autoflowering genetics which are pushing the boundaries of what can be done with autos. All the strains in the Boutique line are big, tall, heavy -yielders and have been produced in-house by Shortstuffs master breeders.